Three years ago, Gary's life spiraled uncontrollably. His family life was in shambles and his body was deteriorating from the inside out. See how he found the fit freeway! In 2009, I was in the middle of a divorce and partially unemployed. Coming home to an empty house without my daughters after seeing them every day since they were babies was beyond tough. When I didn't have my girls, I spent most of my time depressed in front of the TV, eating and drinking whatever I chose. 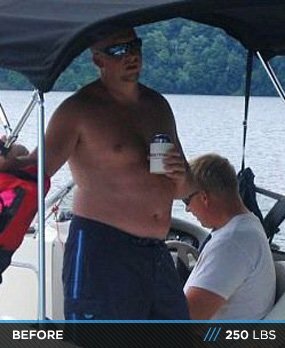 Seeing firsthand how overweight I was in a picture of myself on a weekend lake trip made me sick. I immediately decided to change. January 1, 2010 was my start date. The first six months of my weight loss journey consisted of lifting, a little cardio, and watching what I ate. I wasn't counting calories and knew nothing about macronutrients. I lifted weights in 2007 and joined Bodybuilding.com to learn more about bodybuilding. I learned a lot about lifting, but nothing about nutrition and building muscle. This time, I decided to do it the right way. I signed back into my account and researched about fat loss and lean muscle building. I realized nutrition was 85 percent of the muscle building-fat loss equation and it was the missing piece to my fitness puzzle. The reason I failed years before was crystal clear—I didn't have the slightest idea how to eat healthy, which stalled any gains I could've made. After reading up on nutritional information, I tried nearly every diet in the Nutrition section, vigorously attempting to cut fat. Fast forward three years and here I am. I have a daily diet that I follow religiously and count calories and macronutrients to the gram. I love what I eat and still have at least one cheat meal per week even during my spring and summer cut. I even drink beer. Do I miss all the garbage I used to eat? Yes. Do I feel better than I did when I was 25? Absolutely! I ate, drank, and slept bodybuilding. If that's your goal, you can't do anything else. That doesn't mean my life was consumed by it. I spend 50-60 minutes a day in the gym, 5-6 days a week. I no longer do any cardio, except for a few weekly tennis matches and bike rides with my daughters. I have a wonderfully supportive girlfriend who makes our incredibly delicious dinners. It's quite manageable to do this and still live a normal life. Everything is in moderation, as everything in life should be. The toughest part of my transformation was educating myself. Soaking up nutritional science was a daunting task. There are many ways to diet and not every plan works for everyone. The plateaus were very tough. How could I win a fight against fat that I carelessly acquired? The extra skin was a concern too. What if it still remained after? Consistency was key; it's why my body is able to recover so well. My advice to someone who craves a similar transformation would be to do your nutritional research, create a lifting regimen that fits your schedule, and consistently. I'm proof it can be done at the age of 40. Most people buy a sports car during a mid-life crisis. I chose to put the time in and create a body I should've had in my 20s. After reading about supplements, ingesting tons of reviews, and hearing other's results, I came to the conclusion that less is more. Whole foods are the best way to achieve the body you desire. The only supplements I found useful are: whey protein, BCAAs, micronized creatine, B-Complex, fish oil, and a pre-workout/N.O. drink. I practice intermittent fasting, which means I fast for 16 hours a day and have an eight-hour feeding window. My first meal of the day is lunch at 2:30 p.m. after my workout, and I finish with a meal by 10:30 p.m.
My calories are usually between 2000-2400, and my average daily macronutrients are 235g proteins, 200g carbs, and 65g fat. I try to hit each muscle group twice per week on a 5-6 day schedule, always lifting to failure in the 6-12 rep range. I'll use a de-load week when I feel rundown. I let my body tell me what it can endure. The most challenging part about the transformation, aside from always being hungry and getting my nutrition squared away, was not being able to have the body I wanted immediately. It took me nearly three years of serious dedication to get where I want to be, and I'm not done yet. I've dreamt about being in shape from the time I was a teenager. It took hitting rock-bottom to push myself beyond my comfort zone. If you want something bad enough, it's possible to break through all obstacles in order to achieve your goals. I plan to keep living healthy, lifting heavy, and hopefully become an inspiration to others. Most importantly, I'm glad I decided to make life changes so I can see my daughters grow up. Make realistic long and short-term goals. Don't be discouraged when you fail. Just work harder to overcome. It works. Do your nutritional research. Without proper nutrition, your goals won't be met. Create a balanced diet and track your calories and macronutrients. If you eat it, log it. Create a lifting routine that fits your schedule and stick to it. Schedule a cheat meal once a week. I've wanted to quit many times over the past three years because changes were painfully slow. You'll experience the same at some point. The only thing you can do is work harder, eat smarter, and overcome. 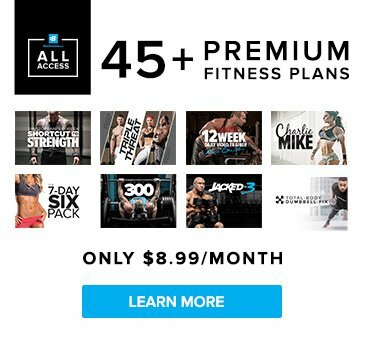 There's a wealth of information on Bodybuilding.com that offers a full range of diets and lifting techniques. You'll never be able to read it all. Find BodySpace members who inspire you, find out what works for them, and follow nutritional and workout logs created by successful members. Pick the physique you want and build it.